Democratic heavyweights feted embattled Congressman Charles Rangel during the longtime politician's 80th birthday fundraising bash at the Plaza Hotel last night -- at times ripping into those who opted out of the invite. "This damn sure ain't no funeral, is it?" 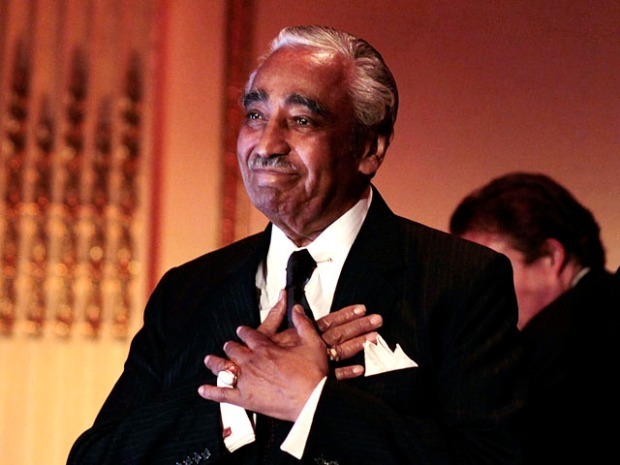 a jubilant Rangel told the crowd in the gold-gilded Grand Ballroom Wednesday night, a day after he promised to fight the ethics charges now dogging him after decades in office. "I ain't thinking about giving up." Sens. Chuck Schumer and Kirsten Gillibrand, Gov. David Paterson, Attorney General Andrew Cuomo and Mayor Michael Bloomberg were among the politicians on hand at the birthday bash where guests -- who paid upwards of $200 to attend -- sipped cocktails, dined on roast beef and turkey at a lavish buffet and noshed on hors d'oeurves served by white-gloved waiters. "I know a lot of people couldn't be here tonight because, as they tell it, either they had to get a haircut ... or they were sure they'd have a headache," quipped Bloomberg, taking a jab at the politicians who declined to attend. "Charlie, you know they were with you as long as they could be." Take a peek inside embattled Congressman Charles Rangel's birthday bash where Democratic heavyweights feted the longtime politician's 80th birthday during a fundraiser in the Grand Ballroom at the Plaza Hotel last night. About a dozen placard-waving protesters gathered outside the Plaza last night, drawing the ire of former Mayor David Dinkins, who flipped one vocal dissenter the bird on his way into the fete. But the ill-feelings weren't felt inside, where Rangel stood on stage later in the evening as singer Dionne Warwick lead the sold-out crowd in a rendition of "Happy Birthday." He was then presented with a cake and blew out the candles on stage. "Ain't no stopping me now!" Rangel told the crowd. The Governor said last night he could understand why ex-Mayor David Dinkins flipped off protesters who called for Congressman Charles Rangel's resignation outside the Plaza Wednesday night where the longtime politician celebrated his 80th birthday.